Matt aka saintjohnrailfan has been out taping trains again. Here are a few of my favourites from yesterday at McGivney. A honkin' big CN 121 blasts through McGivney in the dark with IC 2714, CN 5507, 8801 and 2683 pulling 162 platforms. Around sunrise, CN 305 rolled through McGivney with 5717, 5548 and 5531 pulling 98 cars. There were quite a few autoracks on the tail end. Next, CN 473 went through around noon. It had CN 5319 and IC 6130 pulling 60 mixed cars. It's hard to tell 473 and 305 apart, unless you know 305 goes first! I'd say Matt had a good day! Here are two (silent) videos of freight trains in Amsterdam. The first shows a VolkerRail diesel engine leading a unit train. The second shows a pair of RaiLion electric engines pulling a longish freight train. I say "longish" because it seems long for the Netherlands but definitely not long by North American standards. This was one of the rare freights I saw with two engines. Here are a few photos from Amsterdam. Two trains race into Centraal Station. The rear one is a "Sprinter". The Thalys train outside Centraal Station. Apparently it goes between Amsterdam and Brussels, and also to Cologne and Paris. "Every train has 8 synchronous AC traction engines, producing 8.800 kW. Has a weight 385 tons. Is 200 meters long. Has a capacity of 377 seats (120 in Confort 1 and 257 in Confort 2)"
One of Amsterdam's wonderful trams. They are very popular and pleasant to ride on. Note the Maintenance-of-Way (MOW) equipment on a back track. My wife and I are in Amsterdam for a few days for a conference. We arrived around noon Saturday and we're leaving Thursday morning. We've been having a great time. We took a train from the airport to Centraal Station, not far from our hotel. Nice. There is a great system of public transportation here, as one would expect in Europe, and we have used the tram several times. I like it a lot - very quiet and smooth. The trains are constantly going in and out of the station. There seem to be several different companies' trains, from the blue and yellow to something called a Sprinter to the ICE train. Railfanning would be ridiculously easy here. Here are a couple of videos I took from the 6th floor of the hotel. Sorry for the lack of sound - I was using the cheap Fuji. I also apologize for the window glare. If I have time, I'll try to get outside tomorrow for a few minutes. I appreciate everyone who comes to visit and read. If you like, you can subscribe by email. So far 10 people have done so! If you use an RSS reader, then you can use this: subscribe in a reader to be informed of new posts. 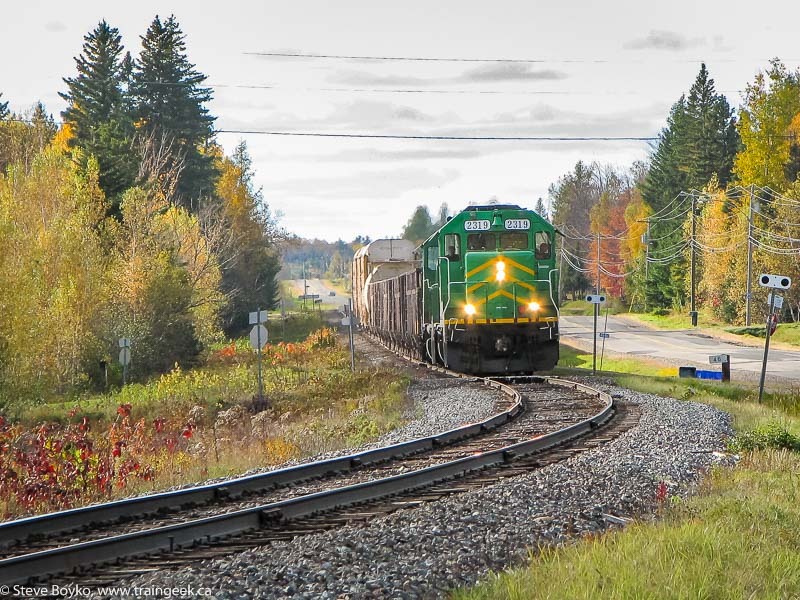 SD50 CN 5433 powers CN 307 out of Amherst, Nova Scotia. I had an interesting email late in September from Megan, a Communications Specialist from GE. She was writing to inform me of the the launch of the Vancouver Olympic Games Spirit Train. "The train is a partnership between GE and Canadian Pacific and is designed to be a mobile ambassador of goodwill traveling across Canada celebrating Canada's athletes, Olympic heritage and Canadian pride." She also included a blurb about the GE Evolution engine: "As you know, the Evolution series locomotive is the most technologically advanced, fuel-efficient and eco-friendly diesel-electric locomotive to date and was one of the first GE products to be "ecomagination" certified". I put a modernized version of the McAdam Subdivision timetable online. This is based on old CP timetables plus current observations. I do not have an NBSR employee timetable, so I have no idea what theirs actually says. Please have a look and offer your comments. Here's a very nice video by Julien Boily. It's a very simple concept - runbys of short VIA trains - but well shot and nicely composed. Here are a few photos I took one weekend in July 2006 at the New Brunswick Railway Museum in Hillsborough, NB. Ex-CN 8245 at night by the station. The same consist by day. 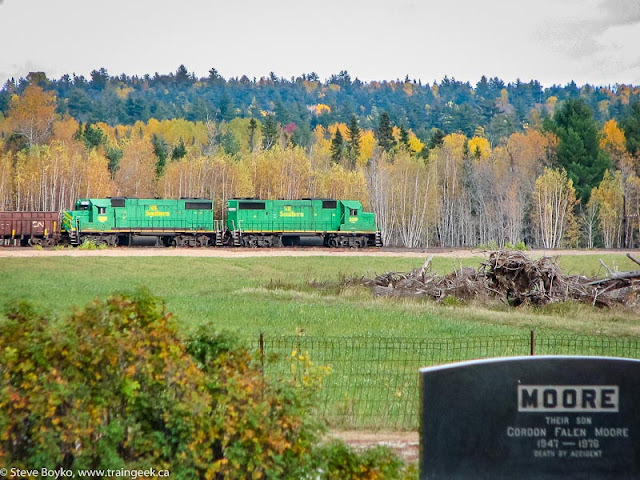 Matt posted a video of CN 436 at Marsh Junction leaving Moncton with the nine export locomotives. The video was taken at about 19:30. Nice use of the car headlights to get some light on the subject! Looking for something to do this weekend? 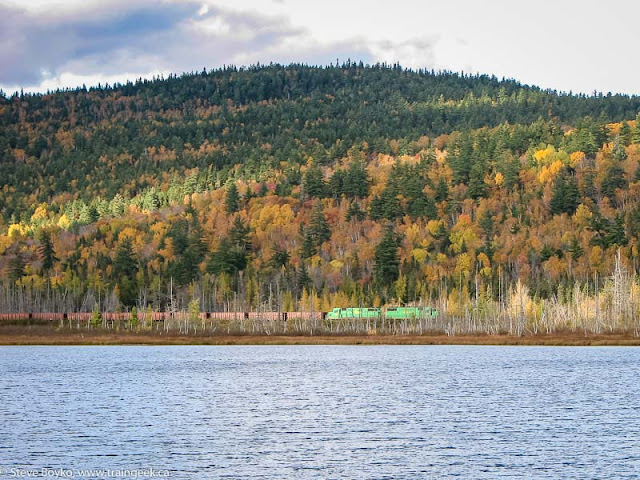 Why not head to Orangedale in Cape Breton for the "OrangeRail - Work Days and Slide Shows". "Star presenter will be Stan Smaill, a CPR Train Dispatcher from Montreal who will show us the highlights of his 1975 trip to Cape Breton and Prince Edward Island. Don't miss this featured show but do bring your own images to join in the fun. Kyle will provide us with lots of challenges for the work day, notably, a clean up after this week's demolition of the old house which stood in our front yard." Some accommodation available, all meals are potluck for participants. For more information about Orangedale, visit the Nova Scotia Railway Heritage Society site or this site. Today (Tuesday) I was working near Saint John, and on my way back to Fredericton I passed through Welsford. Bump-bump over the highway crossing, then the usual glance into the siding and WHOA - TRAIN! It turned out that NBSR 2319 East was stopped on the main line for some reason. I pulled over and pulled out my old Fuji A210 to take a few shots. 2319 had her lights doused and both crew were on the ground, walking back to the engine from the consist. I'm guessing they tripped the hotbox detector coming into Welsford and had to fix the problem. Within a couple of minutes of my arrival, they started the engines up (with a big puff of white smoke) and headed out. NBSR 2319, 2317 and 9801 rolled by me at 3:13 PM with 30 cars in tow. CN 436 arrived at Gordon Yard in Moncton at about 15:00. It left Gordon Yard at 19:25 with the same consist, CN 5739, a flatcar, 9 export locomotives, and a trailing flatcar. It will likely arrive in Halifax around midnight. Phil Ross got a great shot of the train at Lutesville. Click on the photo for the large Railpictures version. The export train #436 was due to meet late CN #121 at McGivney. It is due at Pangburn (30 miles west of Moncton) at 13:00. Thanks to Phil Ross for the information. 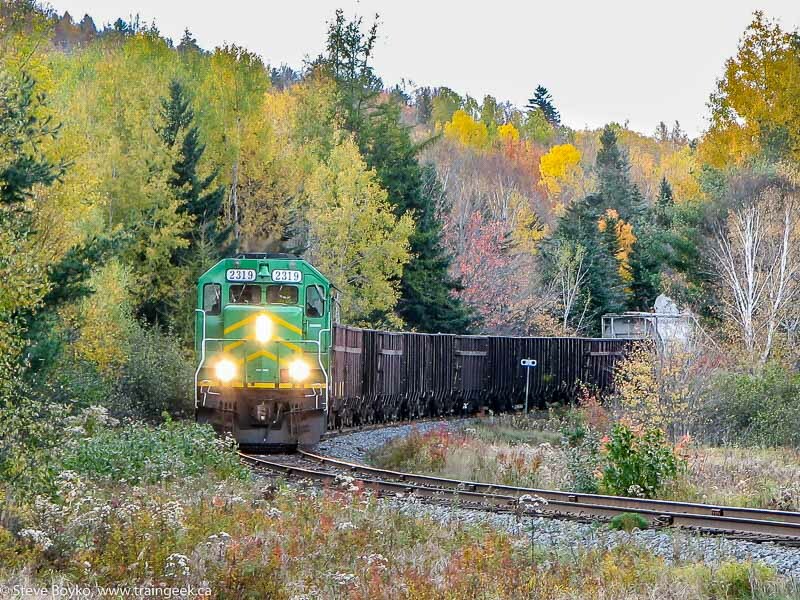 There is a train of export locomotives on its way to Halifax. 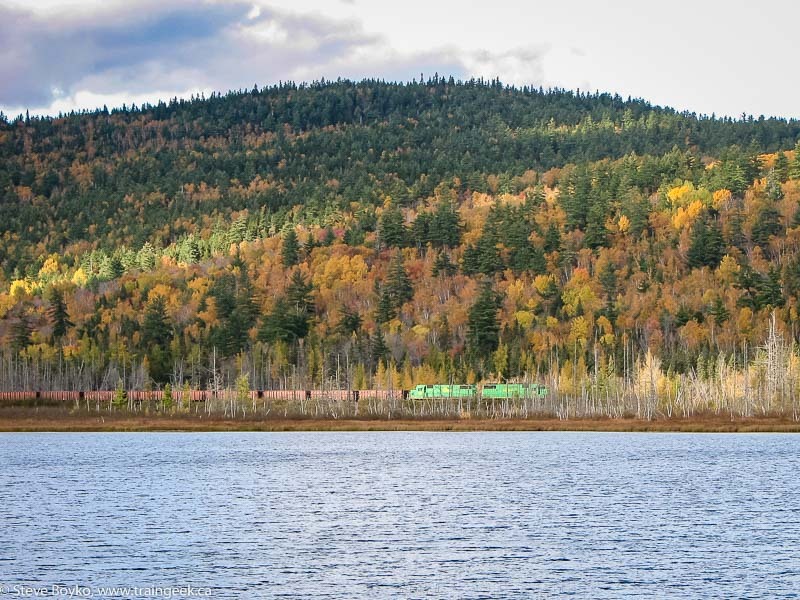 Train 436 is scheduled to leave Edmundston this morning at 11 AM with CN 5739 leading 9 export locomotives (and two spacer flatcars). The export units are Freightliner 66954/5/6/7, Fastline 66302, and Direct Rail Services 66431/2/3/4. Thanks to Bruce Hollett for the numbers. On Monday at 16:36 (Eastern) it went through Belleville, Ontario and it went by Dorval, Quebec at 20:03 (Eastern). At 21:34 it was past Bagot on the Drummondville subdivision, and some estimate it arrived at Joffre around 01:00 this morning. If it does leave Edmundston at 11 AM, it should be through McGivney around 3-4 PM and into Moncton by 6 PM. It is expected that it won't stay too long in Moncton. EDIT: Added details on export units. I want to draw your attention to a very interesting blog by Eric Gagnon, called Trackside Treasure. He has posted some great photos and narrative from train-watching over the years. I encourage you to check it out. Kevin Gaudet posted several videos to YouTube lately from the Moncton area. CN 539 arriving at Gort with some sorry-looking paint on the GP38s. VIA 615 through Gort - nice fall colours. Don't forget about the NBSR Rally of Hope charity excursion leaving at 1 PM from Harbour Station tomorrow (Saturday). This trip is to benefit the Saint John Regional Hospital. The train will travel to Welsford and back in about 2.5 hours. The weather looks good for pictures! 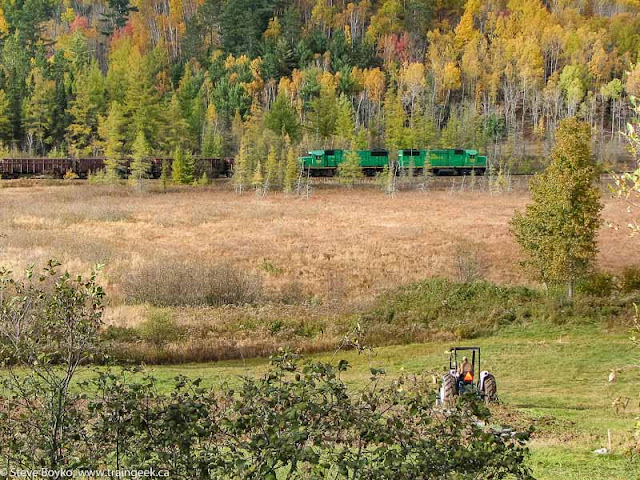 I was determined to get some photos of trains with fall colours in them. My plan was to go out Thanksgiving Monday to St. Stephen and shoot the NB Southern South Job there and on the way back to McAdam. Given its slow speed, there are plenty of opportunities for photos in picturesque locations, as I saw in May 2007. My youngest son and I set out at just after 9 AM. I knew the train would leave McAdam around 8 AM so I figured I might catch it just before St. Stephen. Well, just after Harvey my little guy got quite car-sick and that was the end of the chase. We headed straight home for cleanup and I was a bit bummed out. He recovered quickly enough, though, so after lunch I figured we could get the eastbound NBSR freight instead. We went to Rooth (just west of Tracy) and set up at the private crossing just west of milepost 52. We drew letters in the dirt road and waited for the train to show up. At 15:35 the scanner chirped with the sound of the EOT (End-of-Train) device. Within 30 seconds I heard the nearby crossing bell ringing, and soon NBSR 2319 East came around the corner. It had 2319 and 2317 leading a short train of empty gypsum cars, a single covered hopper, and three autoracks. As you can see, the light was not great. The sun played peek-a-boo all through the chase. I gave chase. He beat me to the next crossing and then I outran him out of Tracy. I was well ahead by the time he reached the Fredericton Junction mile board, so I grabbed a few quick shots there at 15:48. I wanted to get the shot across the field at Blissville to get as much foliage as I could. I pulled into the Baptist church parking lot, and as I was pulling the tripod out of the trunk, I heard the highway crossing bell ring. I set up just in time to catch him going past at 15:59. For my next shot, I went to the long shot at Clarendon. It is starting to get very overgrown along the highway and the shot is going away. Maybe a chainsaw next time... The train was there at 16:19. 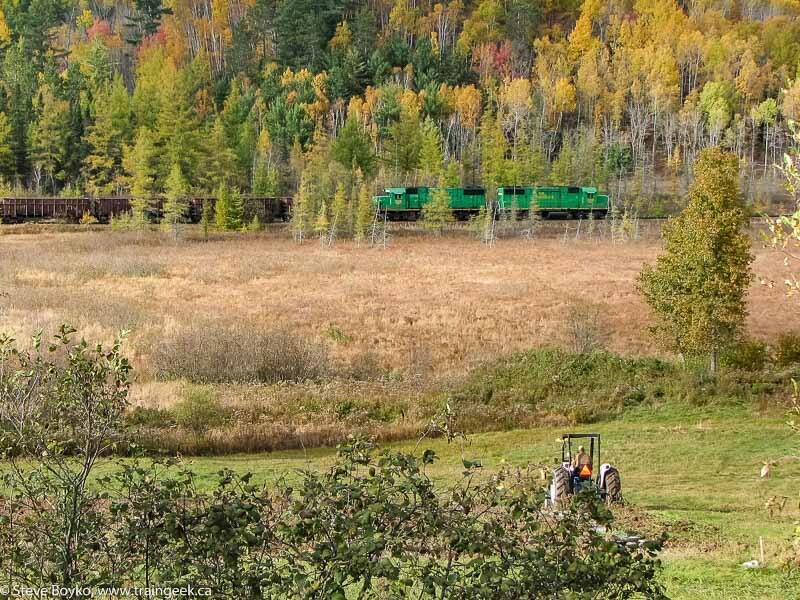 The farmer in the foreground kept on working the field, oblivious to the train. I took the long shot at Welsford Lake at 16:23. This was a very nice location. As I pulled through the west crossing at Welsford, the lights came on. I parked at the fueling depot by the east crossing and shot them coming through at 16:29. That was a great afternoon chase, but it was time to go. Thanks to my son for being so patient! There's another article in the Tribune about the rumoured sale of QRC to CN. It doesn't have anything new, alas. The original rumour said an announcement would take place on September 30 or October 1. So far it seems "business as usual" on the CFMG and NBEC. Young CFMGD has posted some videos of VIA and CFMG. Here is CFMG 6902 leading two other SD40 units at Rimouski (mile 125.0) with a decent length freight train. Late at night, VIA's Ocean blows through Rimouski. Finally, a nice video of NBEC 6901, NBEC 6905 and CFMG 6902 with a decent length freight train near Rimouski. Check out the Riding the Rails online exhibit at the Canadian Heritage Information Network (CHIN). This exhibit shows the railway stations of New Brunswick, and was developed by the New Brunswick Railway Museum in cooperation with CHIN. Danny McCracken was kind enough to send along a few photos of CP units in McAdam in December 1994, just before NB Southern started, and early 1995 as NBSR leased some units. I understand the December photos were taken by Danny's father. CP 1273, CP 8040, CP 8033 and CP 1275 were the power for the train. CP 1275 and 1273 were both SW1200 units. Here you can see 1275 and the nose of CP 8033, an RS23 unit. CP 4231, MK 4303 and BAR 93 were in McAdam on March 20, 1995. I don't know if the units were run-through power or leased by NB Southern. Quite a colourful consist! Thanks for sending those to me, Danny. Gary Lee has a short clip of NBSR 2319 leading the excursion train out of McAdam on September 26. He also has a short but sweet clip of GP9 CN 7010 and GP38 NBSR 9801 in McAdam. CBC is reporting that the St. Stephen Flakeboard Company is laying workers off due to the economic crisis in the U.S. Much of Flakeboard's revenue comes from the housing industry, and the sub-prime mortgage crisis and now the general economic crisis has hit the housing industry hard. These layoffs are obviously going to have an impact on the amount of product shipped by rail on NB Southern. Let's hope the layoffs are short term and the good people of St. Stephen can get back to work soon. I don't know how many people pay attention to video ratings on Youtube, but I do. I appreciate it when people take the time to rate my videos, and I hope they are doing so honestly. I like the feedback on what videos people enjoy, and which ones they don't - hopefully none! ;) For instance, this video features a night shot of VIA 15 at Nepisiguit Junction and it is rated 3 stars. I appreciate the honesty, and I agree it isn't a great video. Now the video below of the CP Reunion train last year in Harvey got 5 stars with 6 ratings, so... great! I do find it suspicious when I see someone just posted a video with only a couple of views and it already has a 5-star rating on it. It's easy enough to game the rating system and rate your own videos, but what's the point? 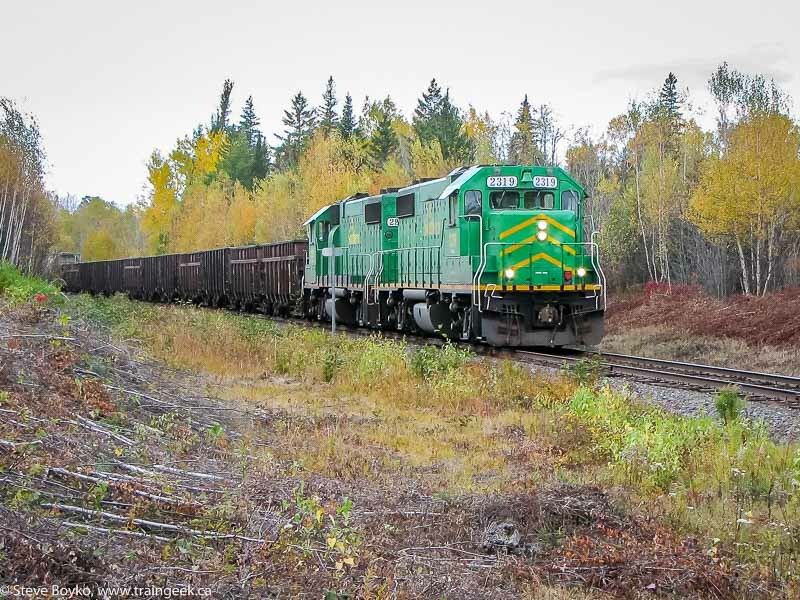 I saw this article in leSoleil about a little bit of rail business for the Gaspe peninsula. Apparently Xstrata will be trucking 14,000 cubic meters of mine tailings to Gaspe, where it will be loaded into railcars and brought to the Horne smelter in Rouyn-Noranda. Additionally, remediation work is scheduled for the Gaspe smelter, closed in April 2002. The tailings come from the Murdochville complex. The tailings are part of the decontamination and decomissioning of the facility, closed since 1999. The article says that there will be 27 sets of 8 cars from mid-October to late November, and possibly another 125-150 cars in 2009. At the time, both facilities were owned by Noranda. Noranda and Falconbridge merged in June 2005, and Xstrata purchased Falconbridge in November 2006. It's good to see some traffic on the Gaspe peninsula. Hopefully more permanent traffic will be found. On September 8 I mentioned I saw three NB Southern log cars in the siding at Westfield Beach. On September 24 I stopped and took photos of the three of them - NBSR 4012, 4018 and 4016. It looks like their cargo will be the pile of old ties beside them. Here's 4012.